I will not bash J.P. Ricciardi for the eight year job he did in Toronto. The fact is we gave him two chances, through a pair of ‘3-4 year plans’ to make the Blue Jays a playoff team again. His failures speak for themself, and it is easy to point to a number of decisions he made that did not work out for the team. I won’t mock, gock, or make fun of those decisions, as it is so popular in ‘Blue Jay land’ to do … well not yet anyway. 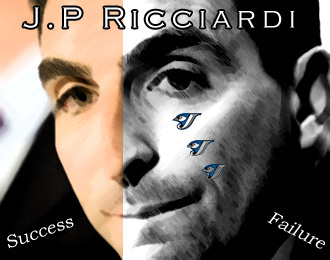 To be perfectly honest, my opinion of J.P. Ricciardi is that he was a ‘mediocre GM,’ performance-wise that is. His cocky, egotistical, know-it-all stance with the media led him into many mistakes ‘running his mouth’ on certain issues. It is a well know fact, that if you can’t back up this attitude, you are going to fall … and fall hard! Year after year, the Jays would truly produce good baseball teams on the borderline of making the playoffs, yet the heat on J.P. swirled around him as if the Jays had finished dead last every year. Fans, the media, even people supporting other teams on this blog site ‘dished out’ the heat on J.P. Unfair? Maybe, but if J.P. were to ever claim that, and I that bet he has, he should take a long look in the mirror because the man definately brought it on himself. At the start of his reign, J.P. was very open with media, took responsibility for his decidsions, and rarely shyed away from the truth. This openess inevitably led to some embarrassment, as it became clear that J.P. was just not a very good liar. General Managers in baseball have to make many very tough decidsions, and similar to politicians, they need to be able to avoid certain questions that might jeopardize them in a situation, or cause further embarrassment. There were instances where J.P. would be hiding something, and then tell the media flat out that he was hiding something from them! 1. One of J.P.’s memorable quotes was: “It’s not a lie if we know the truth,” about infamous back injury story made up for B.J. Ryan when the left-hander was actually having elbow issues. Oh well, I have started to bash J.P. a bit. Here are some of the successes that have set the current Jays up some relative hope, but in hindsight, can also be coupled with failure. 1. Some very good draft picks. One of Ricciardi’s first pick-ups coming to the Jays was Aaron Hill. Amid some injuries and positioning questions Aaron Hill has quickly become one of the best second basemen in Major League Baseball. We would have liked to have him strong in 2007, and a key part of the team playing third base instead of Corey Koskie in 2005, but regarless of those questions around Hill – still a great pick. 2. Adam Lind was also a very good pick J.P. made in the draft, but similar to Hill, had troubled road to the middle of the Jays order. Lind was picked up in the third round of the 2004 draft, and quickly excelled in the minors. It took a couple of years of Lind contending annually for the batting championship in the AAA International League for the Jays to realize that ‘this kid could hit.’ Under Manager John Gibbons (J.P. Ricciardi’s man for the Manager position), Adam Lind wasn’t given much of a chance after some early struggles. The kid became so distraught with the Jays early evaluation of him, that Lind almost quit baseball altogether! With the efforts of newly acquired Manager, Cito Gaston, Lind salvage the 2008 season and ‘turned a corner’ with his bat. 2009 sees Adam Lind contending for the Silver Slugger Award as a DH, we as Jays fans wonder what HUGE, MONUMENTAL waste of talent it has been keeping this guy locked in the minors and doubting his career!!! Still, J.P. a good draft pick … lol Yes. 3. The Roy Halladay contract extension was a great business decidsion by J.P. He made a couple other extension that did not work out so well (i.e. Vernon Wells and Alex Rios) but Halladay’s paid off in spades. The Jays currently have Halladay set with the team for another year, and he is still arguably the best pitcher in baseball. With deeply inflated contracts to guys like C.C. Sabathia and Johan Santana, J.P. extended Halladay to for what seems like a bargain compared to the two previously mentioned. Jays fans should feel lucky that they are able to enjoy Halladay for this, and another year. I commend J.P. for that move, but at the same time you can really fault him for tacking on the dollars, and the years, to Vernon Wells and Alex Rios. I’m of the opinion, shared by most analysts and people that follow the Jays, that the beginning of the end occurred for J.P. Ricciardi before the 2005 season where he drifted far from the ‘moneyball’ strategy that made him such a ‘hotshot‘ coming from Oakland to begin with. Before this season, one of the Jays top advisors (sorry as his name escapes me), a man highly adversed in sabermetrics, and well respected in baseball cirlces left the team. Coincidentally the Blue Jays expanded their payroll that year, and the money staying to fly as if we were trying to compete for free agents with the ‘big two‘ Yankees and Red Sox. Many talk about the ‘beginning of the end,’ when the Jays dished out a terrible three-year 17 million dollar contract to Corey Koskie losing some draft picks in the process. This aquisition baffled many? Yes, Koskie was Canadian, BIG ‘freakin’ DEAL, most in baseball knew he was nowhere near deserving of that money. The smart, ‘moneyball’ decision would have been to keep those picks, and move up and coming shortstop Aaron Hill to third base for his 2005 rookie season. Koskie hardly played a year for Jays before succumbing to injury. loser with a bright future, in B.J. Ryan. One might wonder what the Jays might have become if we pursue this spots through other means?? Closers are often grown through the system, and 15-game winners can be made also without having to overspend on a player that comes with injury baggage. J.P. Ricciardi came to Jays with a method, and it quickly turned into ‘money-flashing madness,’ that would make even the Yankees and Red Sox proud. If you are going to spend, you better make darn sure that you are getting that production in return. I wonder what J.P. thinks now when he sees Vernon Wells’ .311 On Base? Now that A.J. Burnett is likely out of the picture, the Blue Jays will have to look for some ‘rare beast’ of a player in free agency. Who might that be? Well, people have floated around Canadian Ryan Dempster and almost every available bat in the free agent market, with the exception of Adam Dunn, we all know where J.P. stands on him. 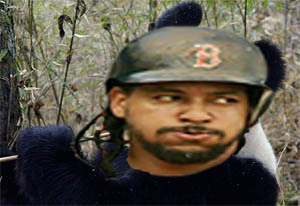 Manny Ramirez looks like a panda, well kind of. No question, that guy is a great hitter, but I think he is going to still be with the Dodgers. The whole ‘Panda Watch’ thing is from the movie ‘Anchorman’, if you were wondering. I found this fun little thing on MLB.com, where if you predict where these free agents will go, you can win baseball tickets. To be honest, I really have no clue for a number of these picks (i.e. just random guesses), however I put Burnett re-signing with the Jays as my pick with the most confidence. Wishful thinking I guess. I’m banking on the Yankees landing both Sabathia and Teixeira as their big free agent splash of the offseason, that everyone is predicting they will make. To me, I can’t see how Manny would choose another team than the Dodgers, given his acceptance with that team this year. The rest are just random predictions, like Lowe and Abreu going back to their former teams Boston and Philly. I don’t know where that came from? Don’t take me as a source on this, check out http://hotstove.mlblogs.com/ and http://allbaseballallthetime.mlblogs.com/ for that. Those guys are very good on the free agent beat! This is a fun promotion, however, and you never know? Maybe some of these random guesses might work out!